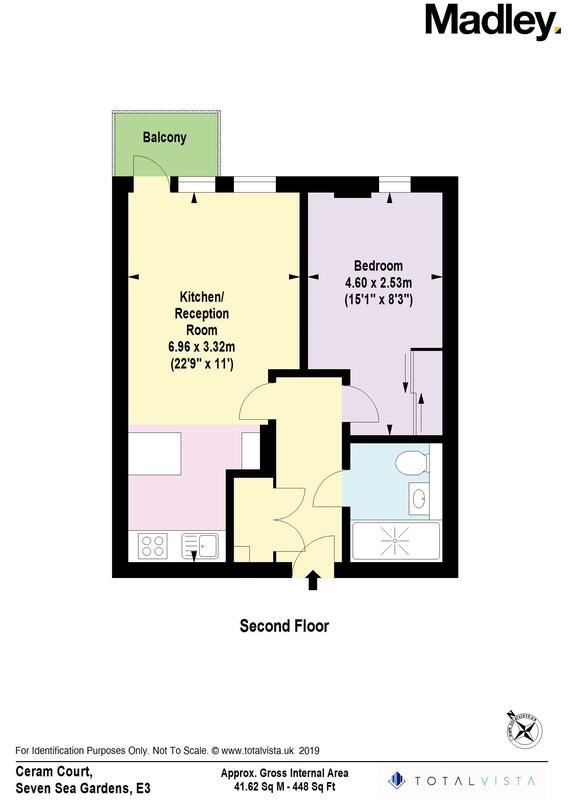 Madley Property present a superb one bedroom property to the market. Ceram Court is part of the fantastic Caspian Wharf complex, built by Berkeley Homes and conveniently located within easy reach of a number of DLR and tube stations. Set next to the Limehouse Cut Canal, the oldest canal in London, the development is just a short walk from Devon’s Road DLR, Langdon Park DLR, Bromley by Bow Tube Station and Bow Road Tube Station (District and Hammersmith & City line), meaning getting to the rest of the city is easy. Especially the nearby areas of Bow and Hackney Wick, which have some fantastic bars, cafes and restaurants. Bromley by Bow has a Tesco Superstore, but there are also local supermarkets and other local amenities, including a gym, just moments away from the property. The development also offers residents a 24 hour concierge and peaceful landscaped gardens. The apartment itself benefits from a smart double bedroom, a bright open plan living area with balcony, a fully integrated modern open plan kitchen and a high specification bathroom, as well as good storage. Residents will also have access to the 24 hour concierge and peaceful landscaped gardens.